For the past couple of weeks I had been craving Indian food, but with bathing suit season on the horizon I found myself reluctant to indulge in the high-calorie fare that my favorite local Indian restaurant serves. After all, what I love so much about Indian cuisine is the fragrant and exotic spice combinations, not the excess oils and carbohydrates (which inevitably leave me feeling guilty the minute I walk out the door anyhow). I knew I wanted a curry vegetable dish, and I had been thinking all week about the perfect recipe for the fresh spinach that I picked up at the Casey Farm Farmer’s Market over the weekend. Out of the dozens of different vegetables curries that I make throughout the year I decided on one of my absolute favorites: a cauliflower and spinach based curry adapted from a recipe that I clipped out of a magazine years ago. The beautiful weather this evening was a great excuse to get outside and grill the tofu on my gas grill, but I’ve also made this same curry with the tofu cubed and browned in a skillet. To keep your tofu from falling apart on the grill, try not to move it until it has formed a nice caramelized crust on the bottom and use a metal spatula instead of tongs. I encourage you to take the time to also make the cucumber riata and serve it alongside; it adds a nice cooling effect to the dish and will help cleanse your mouth in between bites from the abundance of spices. Night before… Place the tofu block in a shallow bowl and cover with plastic wrap. Place a small plate on top of the tofu and weight it down with something like a bag of dried beans or canned good. Allow the tofu to drain overnight. Roast cauliflower: Preheat oven 450 degrees. Line a sheet pan with aluminum foil and spray with olive oil. Spread cauliflower into a single layer on the pan, spray with olive oil, and sprinkle with ½ teaspoon of kosher salt. Roast in oven for 25 minutes. Prepare tofu: Drain tofu, slice into 1” strips (finished size approx. 1” x 2” x 4”) and set aside. In a small bowl combine the rest of the tandoori tofu ingredients. Mix well and brush onto all sides of the tofu strips. Set aside. Cucumber raita: Partially peel the cucumber leaving long ribbons of green on the outside for color and texture. Cut the cucumber in half lengthwise and slice into ¼” half moons. In a medium bowl combine the cucumber with the rest of the raita ingredients and season with salt to taste. Cauliflower curry: Spray a nonstick skillet with olive oil. Sauté onion and pepper until caramelized. Add curry powder and sauté until fragrant. Add the garlic and ginger, sauté for 30 seconds. Add the tomato and spinach and sauté until the spinach is fully wilted. Transfer to a large heat-proof bowl. Add the roasted cauliflower and mix well. Season with salt to taste. Set aside. Grill tofu: Grill prepared tofu on medium-low until caramelized on both sides and heated through. About 5-10 minutes total. 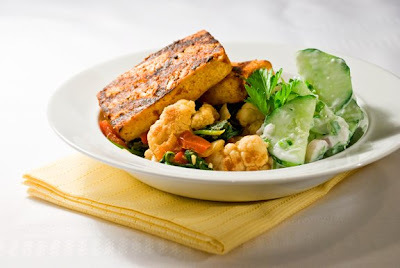 Serve the tofu atop the curry with the cool cucumber raita on the side. Enjoy! It's always a pleasure to read about your cooking and gardening and seeing the thought and passion that goes into it all! BTW, I like your profile picture.